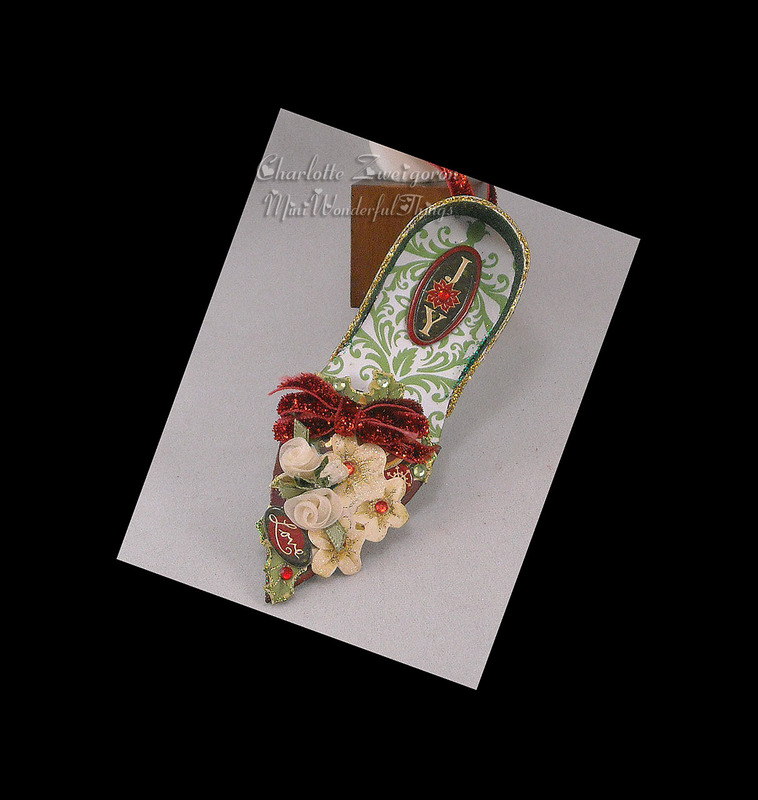 A lovely friend named Sharon called my attention to the need for more of the Mini Victorian Shoes my sister and I have been making. So, this is my recent addition to the collection of mini shoes to hang on the tree. Thank you, Sharon, for this and other great advice and support! Once again I remind you that if you click on the photo, you will get a more detailed look at the photos in my posts. Besides the basic shoe, this has been decorated with a series of small stickers, organza flowers, bling and a little red, velvet bow. It is finished on the back of the heel and the bottom of the shoe with glitter paper. From the pointy tip of the toe to the mid-back of the shoe is exactly 4 inches and it is 1 and 3/8 inches wide at its widest point. The debate that rages on between my sister and I is what to charge for the shoe at the Holiday Bazaar. She keeps saying, “We aren’t competing with Wal Mart, Charlotte!” What do you think? All help and advice will be gratefully accepted!! This entry was posted in art, miniature, papercraft. Bookmark the permalink. Thank you Charlotte. And it is exquisite! I would love to see a whole tree full of them. Very festive Charlotte! As far as what to charge for it I have no clue, but look at what others are charging (if there are any) on Etsy perhaps for something similar. And no, you are not competing with Wal-Mart but you will be in competition with other artists at the show. People will buy what they like if they feel it’s a good value and could not make it themselves. I hope you do well! Susan P.